The most important defence against respiratory hazards is to control the contamination at source and stop it entering the air in the first instance. This however, does not provide the solution to all circumstances and when it does not it will be necessary to use respiratory protective equipment. Hazardous substances that can contaminate the air include dust, gases, fumes, mist, vapours, and smoke. Inhaling such contaminants can cause damage to many parts of the body including most commonly the nervous system, lungs, nose and throat. In some cases they can trigger allergic reactions such as asthma when inhaled. Oxygen-deficient atmospheres (i.e. when oxygen concentration in the air falls below 17%), also present an unacceptable hazard. Occasionally work needs to be carried out in conditions that are described as being Immediately Dangerous to Life or Health (IDLH) and can occur when toxic chemicals, gases or particles are present or when there is a deficiency of oxygen. In such situations, individuals can be quickly overcome, are unable to effect an escape and could suffer severe or irreversible damage. There are two ways to protect against such hazards. The first is to control the contamination at source and prevent it from entering the air in the first place. This can involve isolating the hazard, enclosing the function that is generating the contamination, ventilating the contaminated area and maintaining these systems to ensure they remain effective. In the situation that the source of contamination cannot be eliminated then the second method of protection is the use of respiratory protective equipment. Whilst this is often considered a last resort it is particularly practical when access to the contaminated area is needed for short periods of time or in emergency situations. Respiratory protective equipment suitable for these types of situations include masks, respirators, air-fed systems and self contained breathing apparatus. Anyone who comes into contact with hazards affecting the respiratory system should be aware of the need to use the appropriate form of protective equipment and employers certainly must heed the practices laid down in their health and safety policies and those set out in the Personal Protective Equipment at Work Regulations 1992. Specific regulations also exist to address particular issues about personal protective needs. Currently these include The Ionising Radiations Regulations 1999, The Control of Asbestos at Work Regulations 2002 and The Control of Substances Hazardous to Health Regulations 2002 (as amended). Lives can be saved and the health and well being of employees can be maintained by providing effective respiratory protection for workers in contaminated environments. Many factors determine who should wear respiratory protective equipment as well as how and when they should wear it. For this reason, experts in this field state that one nominated person, usually the safety professional, health and safety or risk manager should make the recommendations on the type and use of respiratory protective equipment. Such responsibility must be placed in the hands of the professionals who will assess the need for a respiratory protection programme at their workplace. This would involve assessing the general health of those destined to use the equipment, because, in case of breathing related conditions like asthma or reduced lung capacity, this may affect their ability to breathe correctly whilst using the equipment. Following the selection of appropriate equipment, the potential users must be trained in the equipment’s proper use including its capabilities and limitations, how to conduct appropriate fit tests, storage, maintenance, use and disposal of the equipment as well as the understanding of the terminology used in the equipment’s manual. Respiratory protective equipment must also be compatible with other PPE worn or used to prevent its effectiveness being compromised. What type of respiratory equipment is available? Generally speaking there are two types of respiratory protective equipment, those that provide an air filtering function and those that are provided with a supply of breathable air. Those that provide a filtering function are not suitable for use in oxygen deficient environments or where the contaminant is unknown. In these instances, respiratory protective equipment that provides a supply of breathable air should be used. 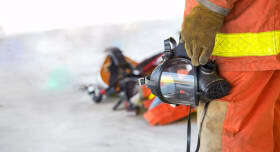 Respiratory protective equipment is expected to be safe and fit for its stated purpose. This minimum expectation is demanded by manufacturers, distributors, legislators and users alike. The industry-wide commitment to responsible manufacturing is supported and governed by a range of standards and regulations such as the European Personal Protective Equipment (PPE) Directive (89/686/EEC). How do you know if the respiratory equipment that you propose to use is fit for its intended use? The simple answer is to check that they have been tested against the relevant standards that apply to your country. There may be different standards for different countries so it is worth checking with your national body that is responsible for Health and Safety. Within the EU there is a legal requirement for PPE products placed on the market to be CE marked, indicating that they have successfully been through the EC Type-Examination procedure, and they must have a reference to a Notified Body indicating that there is in place an ongoing annual quality monitoring of the product or of the manufacturer’s registered quality system. The Type-Examination and ongoing quality assessment will have been conducted by a Notified Body, with the product being assessed to the appropriate Harmonised European Standard, or to a Technical Specification deemed by the Notified Body to meet the Basic Health and Safety Requirements of the Directive. BSI Product Services, as part of the world renowned BSI Group, has been testing and certifying PPE for over 40 years and is a Notified Body for the PPE Directive and more than 16 other Directives. As an independent organisation their impartiality is one of the key strengths affording their clients a real business asset. Expert and experienced staff test and certify respiratory protective equipment to a wide range of standards including British (BS), European (EN) and International (ISO) or manufacturer’s technical specifications. 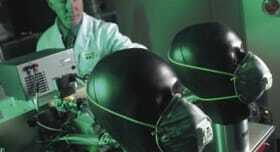 Where respiratory protective equipment incorporates headwear, eyewear or hearing protection BSI is able to offer an integrated test and assessment service. When the products incorporate electronic devices the necessary additional assessments can be conducted in BSI’s comprehensively equipped Electro Magnetic Compatibility and/or Electrical Safety laboratories thus providing the ability to fully test the multiple varieties of state of the art respiratory protective equipment. As part of the BSI Group, Business Information offers guidance books and DVDs on a wide range of health and safety issues that affect the workplace. For more information on these please call BSI Customer Services on +44 (0) 20 8996 9001 or visit the website on www.bsi-global.com/healthandsafety. For the safety of you, your employees and your business be serious about safety and provide the best respiratory protective equipment available.